LeBow names three winners of 'Words I Live By' social media contest. 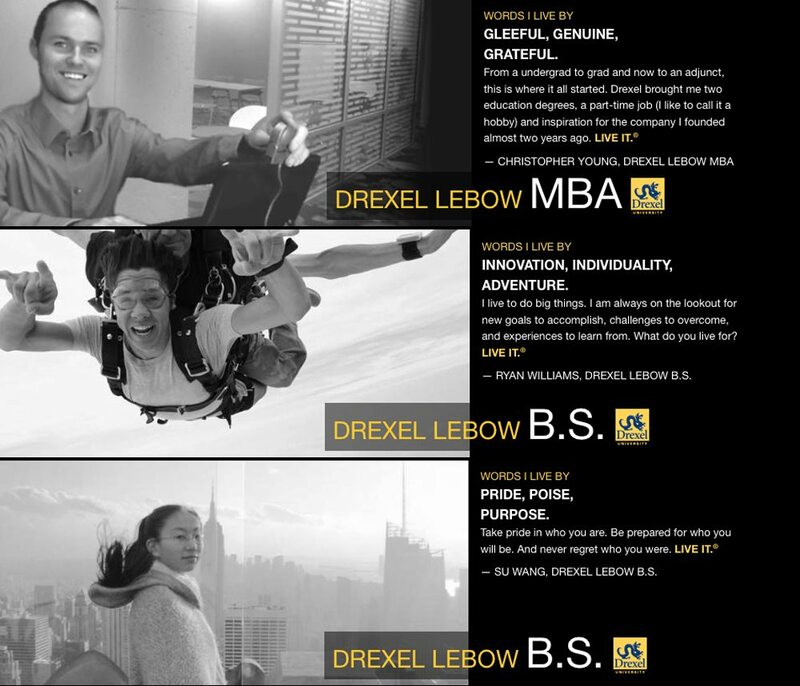 One grand prize winner (to be named soon) will appear in a bona fide Drexel LeBow MBA advertisement. After nine months and more than 200 submissions, LeBow has announced the three winners of our “Words I Live By” social media contest. Freshman Su Wang, pre-junior Ryan Williams and B.S./MBA alumnus and current LeBow adjunct Christopher Young will each receive an iPad 2 at a congraulatory lunch hosted by Interim Dean Frank Linnehan on Thursday, September 27. Following the meal, during which the finalists will have the opportunity to get to know each other and discuss the future of the college, one of the winners will be selected to star as the next face of LeBow’s award-winning “Words I Live By” advertising campaign, which has been prominently featured in print, online, radio and television media formats. The contest, which received remarkable support from prospective and current students, alumni, faculty, staff and friends of the college, was conceived as a conduit to allow the LeBow family to tell their stories in their own words. As a testament to Drexel University’s stature as a hub for new ideas, derivatives of the word “innovation” were the most commonly submitted term. Click here to view all submissions.